Simple Inked allows you to restrict or allow staff users to send individual SMS's to clients. You can enable or disable this function via your Security Settings. Go to Settings, then click Security Settings. Tick Allow Staff to send SMS to Client if you would like staff users to be able to do so. 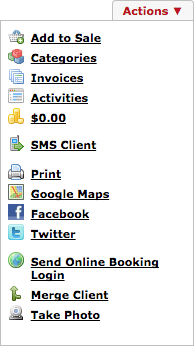 If you do not wish for your staff users to be able to send individual SMS's to clients, keep this setting un-ticked. Click Save once you made your selection. Sending an individual SMS to a client. To send a client an individual SMS, you can do so via their appointment or via their client card. From their appointment, simply click the clients name on their appointment . Now in the Visit Details pop up window, click the mobile phone icon next to clients mobile number. Type the SMS message, and click Send. The other way is to search for the client and go to their client card. In the Actions menu click SMS Client. Type SMS message on right side panel and click Send. Those are the two ways you can send an individual SMS to a client.